You’ve been reading articles and blogs about how to effectively plan your day for as long as you can remember. You set an effective morning routine. You only check your emails at designated times. You muted all social media alerts on your phone. But, somehow, you still can’t manage to be productive. Sound familiar? 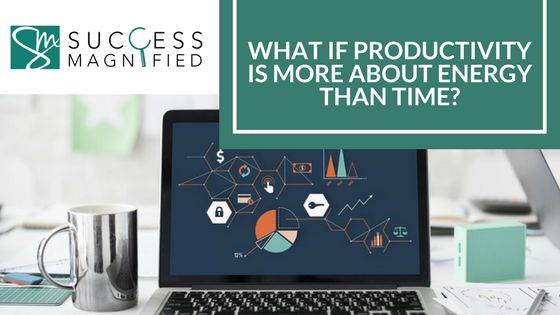 What if I told you that productivity has less to do with your time management and more to do with your personal energy? Turn off electronics at least an hour before you go to bed. Sleep in a completely dark room – get blackout curtains is you need them. Keep the room at a comfortable temperature – studies have repeatedly shown that a cooler room leads to better sleep. Take naps! It may seem counter-productive, but a mid-day nap can really help get you back on track. Being dehydrated can totally drain you of energy. Try starting your day out with a full glass of water before you do anything else, and keep it up for the rest of the day. It doesn’t take moving around to help you get going. Just a few minutes a day is enough to help raise endorphins and boost your energy level. Try taking micro-breaks throughout the day for a quick 5-minute walk or some stretching. Our lives are short, and we all try to cram as much into them as is humanly possible. Next time you’re stressing about deadlines, though, maybe you should stop and take a nap instead of trying to power through it. Your body will thank you with renewed energy, and a clearer focus, when you wake up! If you experience frustration. . .
about lack of time, about feeling less than productive, about not enjoying how you get to spend your time. . .
Join us for the Pinnacle Productivity™ course to transform your understanding of time, productivity, and what is possible for your future..
During this course, we will discover specific, powerful methods to leverage productivity and earnings! Find our next class date here.